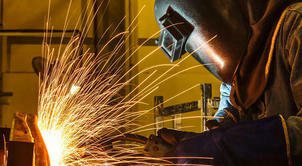 What does it take to be a stellar welder? We find out! If I didn’t feel like an idiot before going into my interview with Garrett Strong, the American online welding teacher who has helped train students all over the world, I did twelve minutes later when I realised I needed to put 001 before his number. It’s 8am his time, but he is more than happy to chat away about his welding hobby and the training videos he shares online. A self taught welding expert, he admits he is ‘pretty damn good’ at what he does, despite deciding not to take it up as a career. Laughing as I ask him what welding is, Garrett is funny, down to earth and despite being 3459 miles away (yes I checked) his advice is relatable and just makes sense. Whether you want to take welding up as a career, make money from it on the side, or just as a hobby, this is one expert worth listening to. I feel like an idiot asking this, but what is welding? (Laughs) well you can weld together steel, aluminium, titanium and all different kinds of metals. I typically weld only aluminium and steel and the enjoyable part for me is that if you have a creative outlet you can build anything. The other day I was in a restaurant and saw someone had welded a palm tree out of sheet metal – it was amazing. So how did you get into welding? Well it was quite simple really, I had some friends that were welders and it became an interest. Also there is a financial aspect to it, I am not a welder by career but I’ll do work on the side – it’s pretty lucrative if you get the right projects. What is the hardest part when it comes to welding? The hardest part about welding is when you’re melting two pieces of metal together; it is not always easy to control the weld puddle. The weld puddle is the spot of the weld at 10,000 degrees so it can be difficult for a beginner to control this. They don’t know where to start, or what the perfect welding process is. The easiest method to get the hang of as a beginner is a mid welder, which has a trigger on it. If you are using one of the more advanced methods like tig welding you’re using both hands and it can be difficult for beginners. What inspired you to start filming your tutorials and teaching people through videos? I was actually a teacher at an elementary school for a while. I had already started a couple of businesses online and I just thought I know how to deliver this; a lot of people want to learn but don’t know how to start. This is something a lot of people want to learn and people are often curious about. There are lots of resources out there but it’s so much easier to learn when you have a video of someone walking you through stuff. A lot of beginners don’t know how to start or what equipment they need – despite what you might hear, you do not need to spend thousands of pounds on a gigantic welder to succeed. What is the most important thing you teach your learners? The most important thing is to teach learners to slow down and take their time. A lot of beginners tend to rush their welds and when you do not get the weld to penetrate deep down in the metal it will not hold, which is important especially if you are welding structural joints. It needs to be well put together and you need to make sure your welds are really hot. When I first started I had several things fall apart on me and I thought what am I doing wrong here? That’s another important thing I guess, you cannot weld for an hour and expect to be good at it – there is a lot that goes into learning the different welding positions. For the most part it’s all about experience, practising and getting confident in your ability. Are there a lot of safety aspects you need to cover? Yeah definitely, welding without a helmet or a mask can be really dangerous – the light that comes off the welder is ultra violet so is ten times worse than the sun and can really damage your skin. You need to protect your face and wear leather gloves so you don’t get burnt. There are also safety factors to consider working with welding tools such as grinders – if you are not careful it will take your fingers off! That sounds like dangerous stuff! Why do you think your videos and the online learning approach is so popular with your students? Well schools are so expensive these days and if you are working full time you might not be able to commit to going back to the classroom. I’m self taught and can weld just fine. It’s more convenient to learn at home without spending a lot of money. What are the most important aspects for students to look for when choosing a course? Well first of all they need to do a bit of research and see what area of welding they want to get into. Whether it’s mid welding, stick welding or tig welding, you need to research it before signing up to a course. My final question is what advice would you give someone who wants to follow in your footsteps and teach welding? Know what you are doing – you cannot teach anything effectively unless you know it yourself. If you don’t have the experience or the qualifications don’t do it; with welding you’re working with a lot and can do damage to yourself that is irreparable. If you weld without proper eye equipment or proper helmets set to the right level you can lose your site. I always say I wouldn’t take advice on how to be rich from a homeless man – everyone’s got their own opinion on how to do things, but make sure you know what you are doing before you go teaching. If Garrett has inspired you to feel the heat and get welding, why not take a look at the courses listed on our site? With plenty of full time, part time and online options available, we are sure you will find something to get you inspired.